When it comes to rice, The Cat and I have slightly different views. The Cat loves freshly cooked rice, pao fan, and zhou. The Cat sees rice as food. I, on the other hand love fried rice, furikake, gravy, and other ingredients or cooking methods that adds flavor and texture to rice. I’ve posted about pao fan and zhou previously. 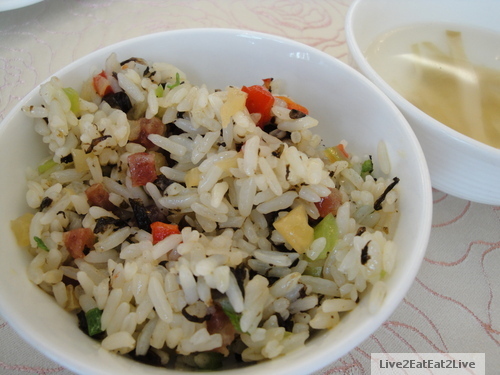 Here are some fried rice and additions to rice we’ve experienced recently. 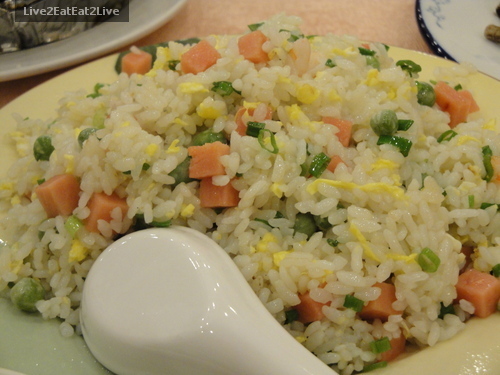 To start, I’ve posted about this fried rice from our dependable chop suey restaurants before. I never get tired of their basic char siu fried rice. To me, it’s a good balance of flavor and textures. When we passed through Shenzhen on our way to Hong Kong during our last trip, we ate dinner with The Cat’s brother. I wanted to try the fried rice. This fried rice was very disappointing. They used some kind of canned meat and frozen vegetables. I’m not opposed to using canned meat and frozen vegetables but this fried rice had no taste and no texture. 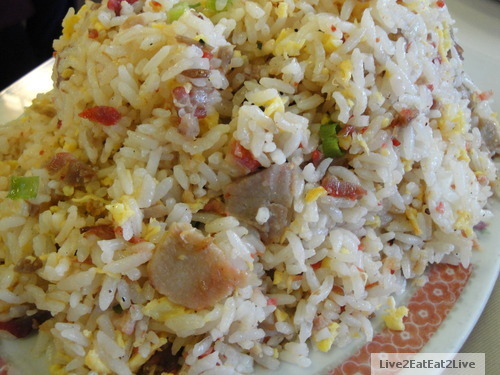 On the other end of the spectrum, when The Cat visited Ningbo recently, at the end of one banquet, “old grandmother’s” fried rice was served. This fried rice included preserved snow cabbage. The host said that this fried rice was usually served after a night of drinking. It was accompanied with a light broth with zha cai (“pressed vegetable”), another type of preserved vegetable. We’ve also tried kim chee fried rice from the Korean market. It’s a little spicy, so I usually eat it with vegetables or meat with little seasoning. The kim chee fried rice is also good eaten with cold tofu. 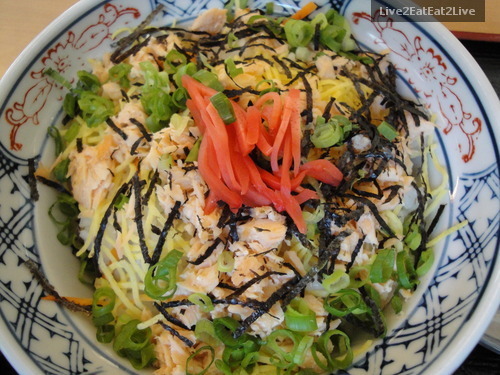 The Japanese restaurant I usually frequent has a sushi rice with salmon donburi (“bowl”) special for the month of August. The whole tray is $8.50, what a deal. The taste is almost like fried rice. Because the rice is not fried, it has a lighter “feel” than fried rice. 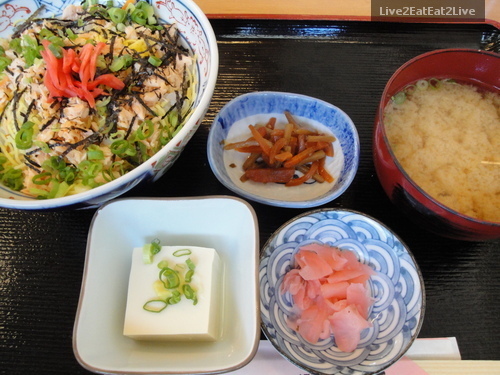 Because it was sushi rice, the dish was not hot, just warm. I thought is was a good choice to eat during the summer. The presentation was also appealing, very colorful and appetizing. 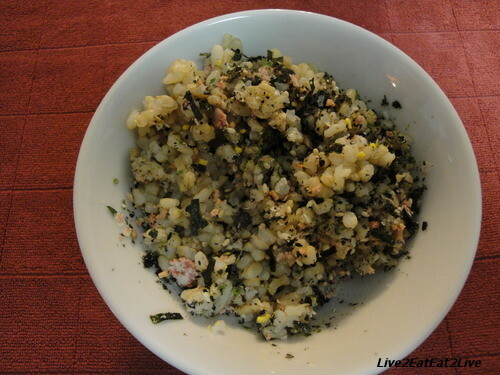 As far as furikake is concerned, I think it’s supposed to be sprinkled on top of rice. This looks good for aesthetic purposes. 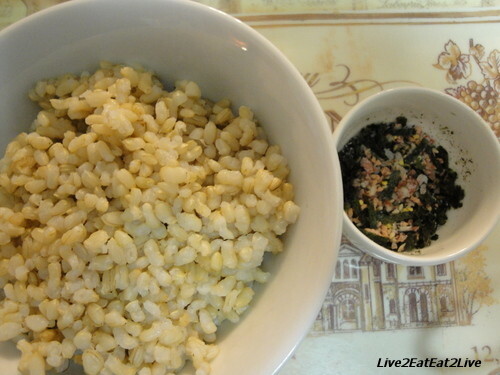 For me, I like to mix the furikake into my rice so that each mouthful has flavor. My method reminds me of fried rice where all of the ingredients are mixed with the rice. The Mouse is going to wash rice now.